Previously available only in France, Blade's Shadow game streaming service is now taking early U.S. signups —with an iOS app pending approval, AppleInsider can confirm. U.S. subscriptions are currently limited to California, due to the need to keep servers within close range of customers, PCWorld indicated. Blade is however promising "zero latency," as long as a customer has bandwidth over 15 megabits per second. The service is expected to launch stateside on Feb. 15. Each customer will get access to a machine with an Intel Xeon E5-2620 V4 processor, and an Nvidia Quadro P5000 video card with 16 gigabytes of RAM. Combined with Blade's bandwidth, this is claimed to be enough to stream 1080p video at 144 frames per second, or 4K content at 60 frames. Subscriptions cost $34.95 per month for a year-long contract, $39.95 per month for three months, and $49.95 per month contract-free. Aside from iOS, people will be able to access Shadow from macOS, Windows, and Android. The company is also preparing dedicated hardware known as the Shadow Box, coming later in 2018, which will have an AMD APU (accelerated processing unit), two USB 3.0 ports, and two DisplayPort 1.3 connections. The AMD chip was picked for its ability to decode video at the necessary speeds. Blade says it hopes to have 100,000 users by the end of 2018 as it adds more U.S. data centers. 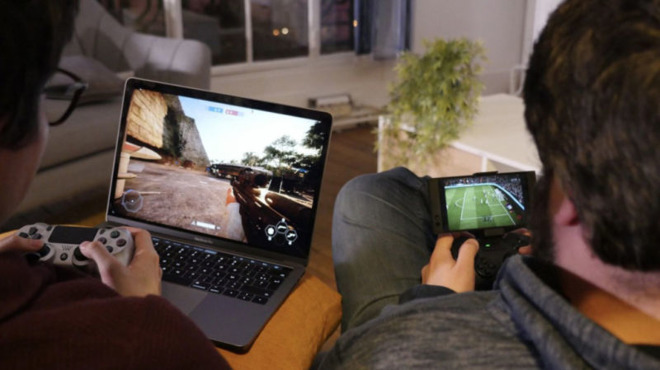 While game streaming services have gained little traction so far, they could prove especially useful for Mac owners. Most Macs have weak graphics performance versus similarly-priced Windows PCs, which cuts off access to some of the more demanding games on the market.